Based in Keighley in the heart of the Worth Valley and Bronte Country one of the most picturesque camping locations in the country all our conversions are completed in house in our large fully equipped premises where we CNC Machine our units in house from either MDF (Budget Range), or Lightweight Plywood (Premium Range) for that "factory finish". We also supply a range of appliances such as glass lid sink / hob (smev), weaco 12v/240v fridges, cassette toilets, control panels, etc. a few galleries of our work and products. 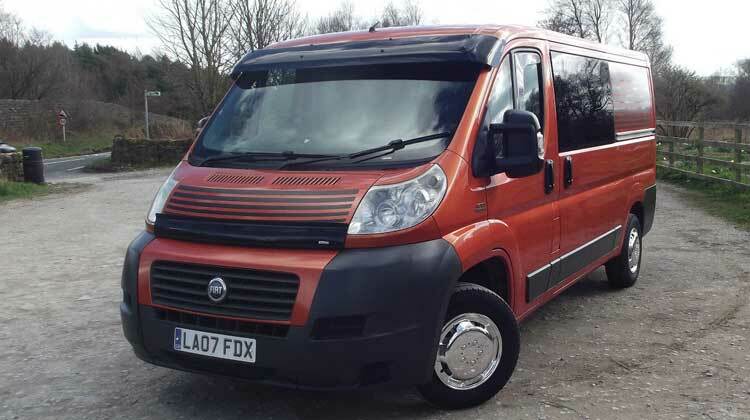 We canDesign your interior, insulate and carpet line your van and fit windows / roof vents / etc..
At Convertavan we manufacture and supply a variety of control panels for Automotive, Marine and Leisure uses. 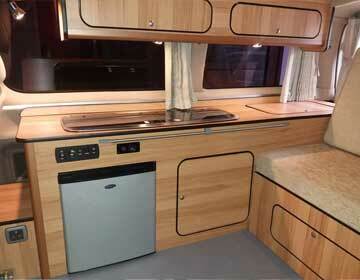 Camper Pod Units are designed to fit the majority of common vans and can be removed from the vehicle if necessary. 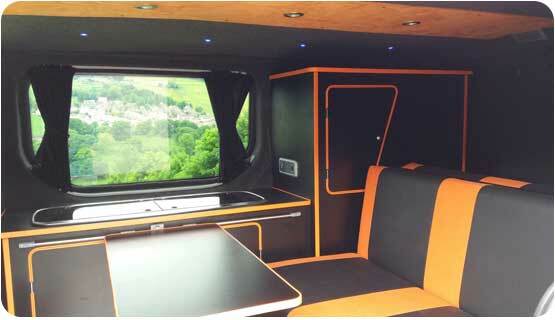 We cover all aspects of van lining from CNC cut ply lining to carpetting and insulation and sound deadening. All our Vinyl Graphics are designed & produced by us on site giving us the ability to design custom graphics. some pictures of our work. Almost anywhere to be honest. We have our own online Web Shop, an Ebay Shop, a Facebook Shop, most items can be posted at very competitive rates as we have accounts with all the major couriers, We take pride in our online sales record and are more than happy to discuss any requirements. We have our own unit/showroom where you can come and view our products, we normally have a conversion in progress, most items are in stock we can also custom make Units & Control Panels on site to your own specification. everything from a single switch to a full conversion. 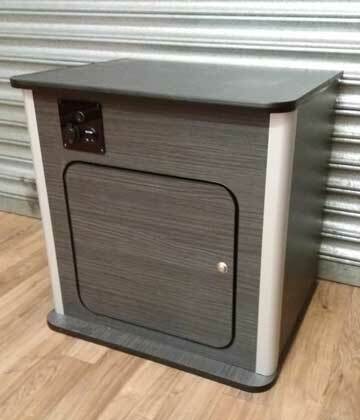 We offer full & part conversions which can include insulating and carpet lining your van, fitting windows / roof vents / etc..
Our units come in a variety of finishes & colours and as they are all manufactured on our on site CNC router we can customise them to your requirements . We can also supply a range of appliances such as glass lid sink / hob (smev), weaco 12v fridges, cassette toilets, control panels, etc. At Custom Control Panels we manufacture and supply a variety of control panels for Automotive, Marine and Leisure uses. 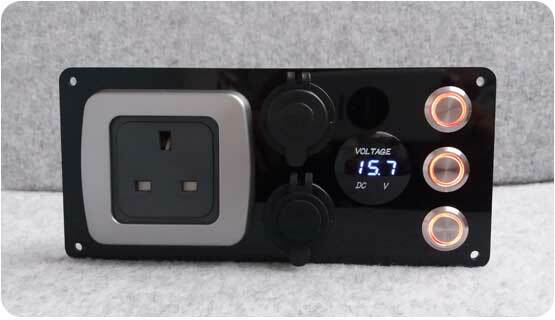 Panels can include USB sockets, Lighter Plugs, 240V Sockets, Digital or Analogue Voltage Gauges, Rocker Switches, Toggle Switches , Missile Safety Switches. 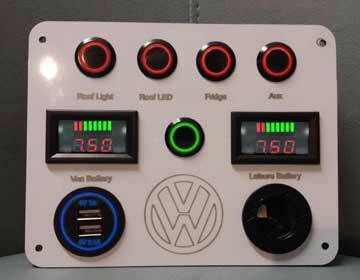 We can design & custom make control panels to your specification as all our panels are laser cut for precision. Our Rock & Roll Beds come in a large variety of finishes including cloth, faux leather & faux suede. 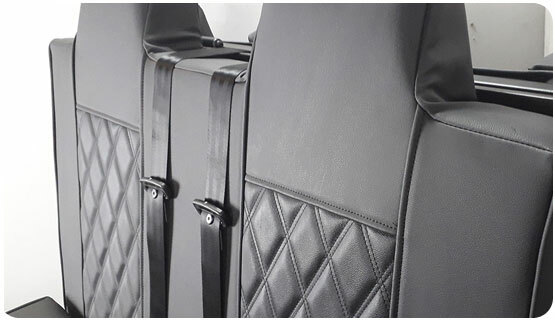 Customisations include piping, "Bentley" stitching, Hex pattern, manufacturer fabric to match front seats and logo embroidery. Beds are available as standard MOT compliant with belts or M1 Tested for added peace of mind. 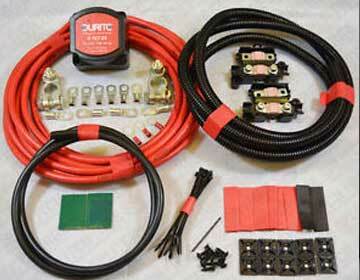 Diesel heaters are an efficient way of providing a reliable heating source for you camper. 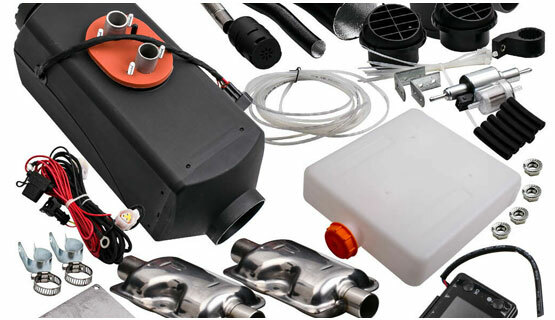 Low fuel consumption, and compact size make them ideal for any size conversion and as they can run directly from your vehicles fuel tank you dont need to worry about running out of heating when on the go.